After listening to all involved parties including teams and sponsors it has become very clear that the global economic conditions are affecting this industry at every level. Whereas most companies want to fully support our series, the ability to spend as in previous years has been dented. This of course directly affects teams, many of whom are suffering from reduced budgets which reflect the current environment. In addition to these issues we also have date clashes which, as always, we do our utmost to avoid. Based on these points we have decided for 2010 only, to reduce our series to four top class events in order to help everybody work within their budgets. Despite the reasons behind these changes we can assure everybody that the four events will be of a premium standard with every effort made to ensure a fantastic atmosphere and value for all. Check it out clicking here! Team All Russians Moscow is pleased to announce that the team will play in the Millennium's SPL division in 2010 season, after an astonishing season in Div 1 in 2009 (four first places in all qualifying events, 16th in the Millennium Cup) gaining promotion to the SPL. As in 2010, the team strongly aims at continuing its sequence of victories on the Millennium fields, this time in a higher division. Our coach, Konstantin Fedorov will assist us with this ambitious goal. While completing its roster for 2010 the team has also made several transitions and invited new players, coming up with a well-balanced company, which we expect will be able to rank high in SPL. The teams target for 2010 is to gain promotion to the CPL for the 2011 season. The team is still reviewing its 2010 arrangements with potential sponsors (sponsors still welcome!). If your company is interested please contact SHELEH1234@GMAIL.COM (please note this opportunity will be closed soon). Manchester Method is proud to announce that they will be playing the SPL Division throughout the 2010 season. In this highly intensive cauldron of competitive paintball, Method have brought together some of the brightest talent in the UK. With the addition of Bobby Aviles, whose tactical and leadership abilities will be added to the line up, Method are training hard for the new season. Wearing the full Laysick and Sheath range from Kartel Prime, Method is keen to bring the new ground breaking designs by Sam Smith, to the tournament scene. Outside of the playing gear, Method will also be wearing the new casual line, offering the player a stylish and sharp look. Every team also needs the support of a leading marker. Method are excited and honoured to be in the Planet Eclipse Stable and shooting the new Laysick Ego for 2010. Reliability, performance and not least the fantastic support and backup makes this a winning combination. Come and support the best looking paintballers in the UK at our Manchester Method Facebook page, where you even get a free sticker! Even better, come and join the Laysick family at the Millennium booth, where the cool kids are at!! 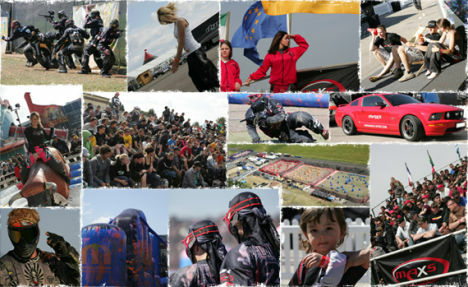 PRESS RELEASE: New SPL team "Boost Air Rennes" for the 2010 Season! "BOOST'AIR RENNES is a young French team based in Rennes, France. For the upcoming Millennium season they will compete in the SPL division making their debut in Malaga, in April. This is also the first official team that will shoot the new .50 caliber and represent G.I Milsim products through Paintball Distribution, the French distributor of GI Milsim. The players are pretty young, ranging from 17 to 25 years old and are currently training hard at their local field, Elite paintball in Ploermel, France! BOOST'Air Rennes would like to thank its sponsors, Paintball Distribution, G.I Milsim, Artsquad Clothing, and Elite Paintball Ploermel and present you with their new Artsquad jersey!" The Millennium Series is pleased to confirm that its second 2010 event, the Maxs European Masters, will be in Bitburg, Germany on May 21st to 23rd 2010. As always with this event, we fully expect a great party atmosphere. We have an excellent deal with the Eifelstern hotel once again, and with its bar and nightclub plus the other nearby clubs and bars, we are very sure that all participants will have a fantastic time. This event is part of Paintball history and always a players favourite. Hotel deals and information will be available shortly. Registration for this event is now open! Please visit www.millennium-series.com for further information on registration and for venue details. "STAKO has been involved in the design and manufacture of pressure tanks since 1967. Today more than 4 million cars are running around the globe equipped with our low-pressure Liquefied Petroleum Gas tanks. Every year we get close to half a million happy new customers in 55 countries on 5 continents. Our adventure into Paintball originated from the passion of one of our clients. Today we are proud manufacturers of the World's lightest compressed air 1,1L cylinder. We are seriously now growing stronger in this Industry with new, revolutionary products." Arek Kubasik, Stako. Kingman Group is excited to sponsor and attend the 2010 Millennium Series of events. Look for a trade tent at all 5 stops this year where staff will be ready to answer questions on the Spyder, Spyder .50 Caliber and Kingman Training product lines. Kingman Group manufactures the top selling Spyder .68 Caliber paintball markers, the all new for 2010 Spyder .50 Caliber paintball markers, and KT .43 Caliber paint pistols. Since 1992 Kingman Group has employed a simple motto, "pursue the ultimate, without paying the ultimate price" for paintball sport. We continue that same practice today. Stop by the Kingman tent in Malaga, Spain to test shoot the all new Spyder .50 Caliber markers. Visit www.kingman.com for links to all of our paintball brand websites. Kingman Group is "The Only Choice For Paintball". The Millennium Series says THANK YOU for 2009!